Our popular PERLAVITA line now in the very fashionable LUNA style of the Murano Glass colors. 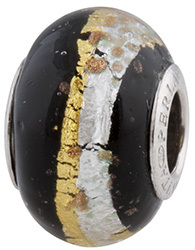 The ebony black base is offset with the bands of silver and gold with a sprinkling of aventurina around. These beautiful designs are then encased in clear Murano Glass which gives it depth. The insert is Rhodium plated .925 sterling silver. The hole size is approximately 4.7mm and will go over the popular bracelets.